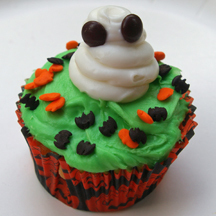 Use a pastry bag to make cute little ghosts that perch atop your Halloween cupcakes! What You Need: 1 cupcake; green frosting; Halloween sprinkles; 2 brown mini M&Ms, white frosting; pastry bag; round metal tip (I used #5). How to Make It: Frost cupcake green. Use pastry bag to pipe ghost in a swirly motion. Add M&M eyes. Add sprinkles. This entry was posted on Tuesday, October 13th, 2009 at 8:55 am	and is filed under Halloween cupcakes. You can follow any responses to this entry through the RSS 2.0 feed. Responses are currently closed, but you can trackback from your own site.